Square Corner Hinge, 5" x 5". Hinges manufactured from solid brass extrusions have two inherent properties: exceptional strength and precision tolerances. 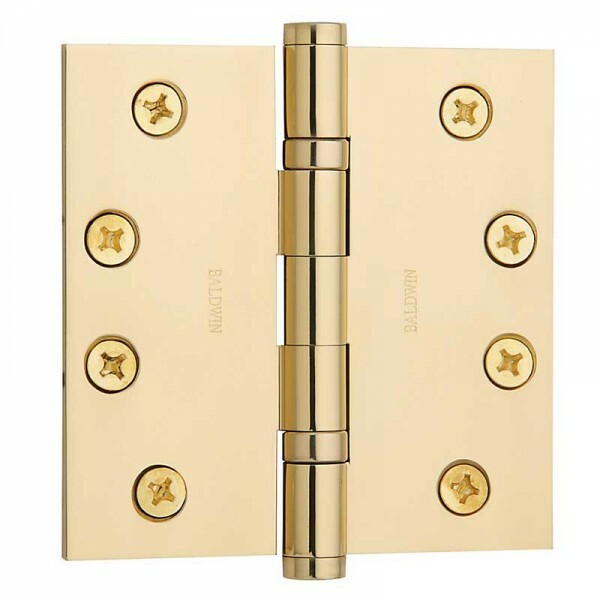 Baldwin’s extruded hinges are machined from a solid brass bar to exact tolerances to ensure an even wear between each knuckle. The result is a QUALITY hinge which can withstand above average door weights and stresses with maximum vertical and lateral wear performance. Baldwin full mortise hinges are classified as STANDARD WEIGHT for installation on doors up to 1.75˝ (44mm) in thickness. Use three hinges on doors up to and including 7.5 feet (2.3m) and one additional hinge for each additional 2.5 feet (.76m) or fraction thereof. All hinges have a slight offset leaf which provides clearance of .062˝ (1.57mm) when leaves are closed and parallel. All hinges have template screw hole locations for use on either wood or hollow metal doors and frames. 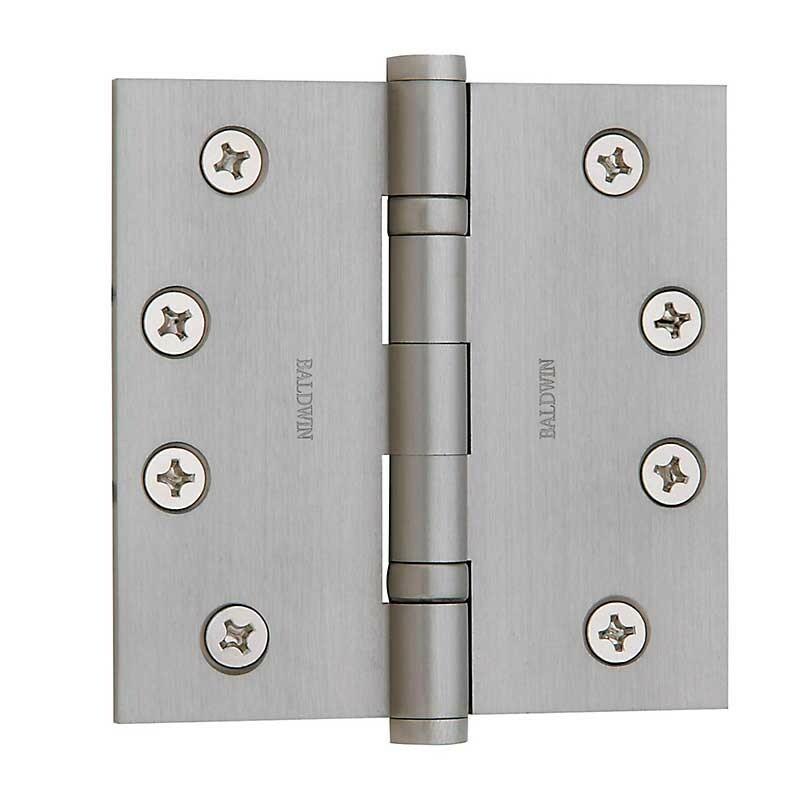 Each hinge is designed with two anti-friction ball bearing assemblies which are non-detachable. The balls inside each chamber are constructed from through-hardened,chrome alloy steel material to ensure a longer hinge life. The bearing races are machined from alloy steel which is then hardened and electroplated with a rust-resisting zinc-chromate finish. Our testing indicates that although this electroplate finish provides rust protection, when exposed to weather elements of exterior, the steel will eventually rust. The location of each assembly increases the vertical load capacity and greatly reduces both vertical and lateral wear of the hinge. As a result, all factors which normally contribute to hinge failure are significantly reduced. BALL BEARING HINGES ARE RECOMMENDED FOR DOORS EQUIPPED WITH DOOR CLOSERS AND/OR RECEIVING AVERAGE FREQUENCY SERVICE.